Get affordable Security Camera Installation on Arcadia, CA and CCTV equipment with commercial quality and 2 years warranty. We offer security camera architecture based on the customer needs. We use the most advanced HD-DVR and NVR, with h264 and h265 encoding. Our security camera equipment can be used on industrial environments, commercial and residential. 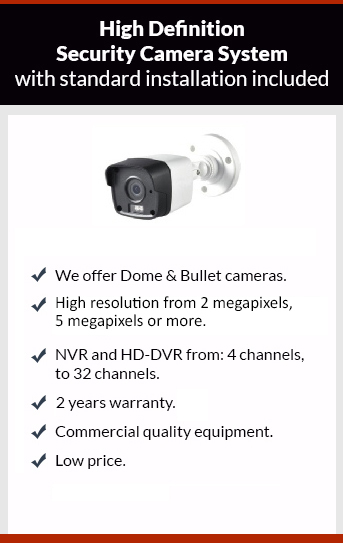 We always exceed our customer expectations offering the best security camera technology. Our standard warranty is 2 years, including labor and parts. With our CCTV you will be able to see your cameras remotely. Give us a call today to book your appointment, the estimate is free.